Burgers are awesome! I'm living on the perfect continent to satisfy any burger craving. There are diners, bars and restaurants on almost every corner serving a myriad of recipes ranging from the traditional favourites to the highly experimental. I've had a few burgers I would class as 'phenomenal' throughout my time in North America so far: notably at the Three Penny Taproom in Montpelier, Vermont, and at Burger Royal right here in Montreal. A few months ago my Toronto friends Juilie & Cory told me about a burger restaurant they dined at in the small Ontario city of Cornwall called Truffles Burger Bar. They spoke extremely highly of it and suggested I check it out with them next time they were in town. Such a recommendation naturally piqued my curiosity, and it just so happened that they made the drive back to Cornwall this weekend. I took the hour-long train ride west of Montreal and joined them both in town for lunch today. To get an idea of what to expect at Truffles, I had a browse through their online menu a couple of days beforehand. The burgers sure sounded impressive - they were definitely on the gourmet side of the scale, ranging from the Surf & Turf (beef, lobster & garlic butter) to the Apple Burger (pulled pork, baked apples & goat cheese). They even had a selection of exotic meats to choose from, such as llama, venison, kangaroo & bison. 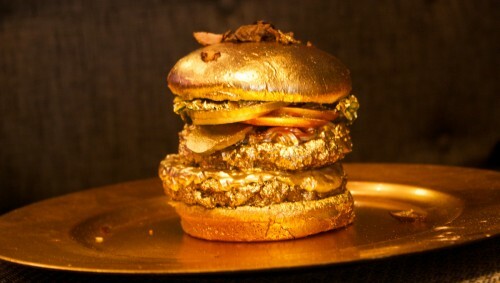 However there was one burger in particular that really caught my attention: Solid Gold Burger Beef + foie gras + black truffle shavings + 23 kt gold dust + glass of champagne Price: $100 Are you serious?! I thought to myself. A hundred dollar burger? That's ludicrous! Who in their right mind would want to buy a gold-dusted burger with black truffles for $100? It didn't take long to come to the realisation that, in fact, I was precisely one of those people who would buy a gold-dusted burger with black truffles for $100.